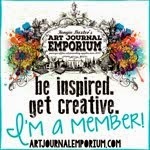 I'm Joy-I Scrap-I'm Happy: Art Journal Caravan Rolls On! Art Journal Caravan Rolls On! It's been a while since I did an AJC page. I was looking through old itineraries that I haven't done (and there are many!) and came across a prompt about actors you think are hot. 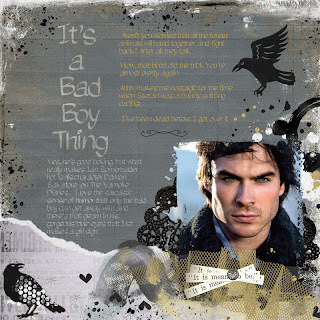 Well, big fan of The Vampire Diaries here so I had to do a page on Ian Somerhalder! You can find the credit details here in my SBG gallery. Can't wait for the season premier on October 11th! Wow Joy!!! Fabulous page with this top looking bloke!! Just love how creative you are with your digi pages!